Why don’t great ideas that are useful and working effectively to solve some of the most pressing social challenges “travel” as well as business ideas do? Why aren’t they able to scale to solve similar social challenges happening in other parts of the world? What is preventing our Ashoka Fellows from scaling their work better and faster? With these questions in mind, in 2009 we launched the Ashoka Globalizer Program to find the answers and potential solutions. The first thing we quickly understood is that scaling social ideas didn’t follow the “market incentives and mechanisms” that business ideas do. When you scale a business idea, the potential of bigger monetary gains offsets the problems and risks. However, when scaling a social idea, what you get is typically larger challenges and problems (more funding is needed, more people to support and help, etc). The other thing that we soon realized is that the citizen sector was extrapolating the experiences and lessons learned from the business sector, which, as explained above, has very different market forces. We studied many frustrated attempts to scale social programs and concluded that on many occasions this failure could be traced to the over-reliance on the conventional wisdom of the business sector, in which “scaling up” typically focuses on increasing the size of an organization. Dr. Steve Collins, the founder of Valid Nutrition, is one such social entrepreneur who has been frustrated by attempts to adapt traditional business models for scaling his impact. Several years ago, Collins revolutionized the treatment of severe acute malnutrition by developing a new method involving individual portions of “ready to use therapeutic food” administered directly by community members. This approach eliminated long trips to overcrowded inpatient treatment centers, reduced contamination risks, and ultimately cut death rates five-fold while dramatically increasing coverage. Based on these results, and the knowledge that demand for treatment still far outstrips supply, the managers of Valid Nutrition felt a burning obligation to extend the impact of its work as widely as possible. Making use of the corporate expansion model prevalent in this industry, and eager to maintain tight control over quality, the business built a factory, hired a distribution team, and established an entire supply chain under direct Valid Nutrition management. Very quickly, however, this approach encountered problems: Revenue growth did not keep pace with costs and the task of directly managing so many processes overwhelmed Valid Nutrition’s core team. Furthermore, Collins’s team was frustrated that their highly centralized organizational model failed to adequately promote local economic autonomy and empowerment – a core value of their community-based care ideal. Collins had bumped into one of the central difficulties in scaling social impact: As you serve increasing numbers, the complexity of your work increases faster than your organization’s ability to manage it. This transition entails isolating the key values at the absolute core of his mission and actively seeking out other actors who could integrate these values into their own activities. Thankfully for Collins, Griesbeck and the growing ranks of social entrepreneurs wishing to scale their impact without necessarily growing their organizations, a robust body of scholarly work has begun to emerge around models and strategies to accomplish this. Indeed, from Greg Dees’ early elaboration of the multiple “pathways to scale” beyond simple branching and franchises, to Bradach’s recent call for creating “100x the results with 2x the organization,” there has been significant progress. Yet, Ashoka Fellows have been calling for scaling guidance with a more directly problem-solving orientation, and to learn firsthand from the struggles and triumphs of their peers who have already walked the path. 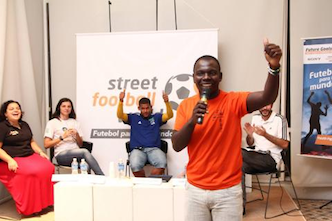 (Pictured left: Future Goals Youth Forum on Football for Social Change, an event in Rio de Janeiro organized by streetfootballworld and held in cooperation with Sony. Image credit: Street Football World). In the process of bringing these social entrepreneurs together and pushing them forward, we have developed a few practical insights. Through the Globalizer Summits and a host of global conversations, the central tenet of scaling for impact has been clear: Let loose a well-defined idea to create a movement or mission-aligned ecosystem, rather than only growing the organization behind it. Two strategic imperatives have shone through: Liberate the core and become a magnet. Globalizer community meets at traveling “Globalizer Summits” for intimate one-on-one or small group conversations to provide strategic advice to each other and build knowledge for the field. We believe that both pathways have the potential to strongly impact the way social entrepreneurs scale up in the future. 1) Open Source Changemaking. In a world of constant change and multiplying problems, both working behind closed doors as well as leadership by one indispensable individual are becoming relics of the past. We must open up opportunities to increasing numbers of people to collaborate together for a common purpose – the heart of all social changemaking. The open source model is a powerful way to do this because it taps into people’s natural motivation. 2) Smart Networks. Leveraging or collaborating across networks in ways that are greater than the sum of their parts, can help us achieve the scale we need. The 21st century will be marked by integrated thinking, interdependent action and international systems change. In a world where it is neither feasible (nor even, perhaps, desirable) for a single person, organization or group to achieve large-scale complex social change alone, what will be required is tapping the power of interconnecting networks to accomplish lasting results. Smart Networks require generous sharing to provide value to others, which makes these networks powerful, cost-effective tools to increase access to information, financing and other resources. For instance, Kovin Naidoo, a Globalizer Fellow from South Africa, spent a large amount of time and organizational energy leading a coalition that was instrumental in sealing a very large grant for substantial work across South Africa. But his organization, the International Centre for Eyecare Education, didn’t receive any of the funds. However, other members of the coalition later approached him to carry out significant aspects of the work, and the centre ended up benefitting more than if it had been one of the initial grantees. Given the nascence of attention to both open source changemaking and smart networking as key pathways to scaling social impact, it’s not hard to foresee a raft of impending challenges. For instance, how do social entrepreneurs learn to emotionally let go of their program to the extent that others can truly take it in new and unforeseen directions? How can they operate effectively in a world conditioned to pursue isolated impact, often driven by isolated investing from a donor community that does not yet recognize that large-scale success will only come from collaboration? And if success doesn’t conform to our standard modes of measurement and resource allocation, how will organizations justify spending resources on these new pathways? These are the types of challenges all innovators are facing and, thus, what the next series of scaling innovations will most likely address. It is not going to be an easy change. But social entrepreneurs have always been characterized by the ability to see over the horizon, to envision a new possibility such as the fact that poor people might be willing and able to pay back micro-loans. So if anyone can lead this type of change, it is the likes of Collins and Griesbeck and the dozens of other social entrepreneurs who have seen beyond the horizon and are quietly shaping new pathways to scale their vision. And, in doing so, they are ensuring that the best ideas reach their full potential: solving intractable social problems and improving countless lives around the world. This article was originally posted on the Practitioner Hub for Inclusive Business as a part of a mini-series on scaling inclusive business. Click through to join the conversation and for articles, toolkits and advice from experts and practitioners. The author thanks Jon McPhedran Waitzer and Roshan Paul for significant contributions to this post. Maria Zapata is the co- founder of the Ashoka Globalizer Program.